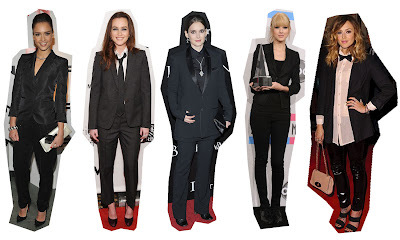 A popular 2010 trend especially in the later of the year was female suits. I'm a fan of androgyny, when it comes to style I find that anyone can wear anything as long as you feel good. Women can wear pants and still look feminine and chic, its actually a look I prefer to than the standard mini dress these days. So in light of the end of the year I give you some of my favourite suit looks over the year. Note I love love love Halle Berry's bespoke suit over the jump.